Mosio for events has some interesting and useful features which you may want to use. Here are the top 3 that many of our clients use, and how to use them. 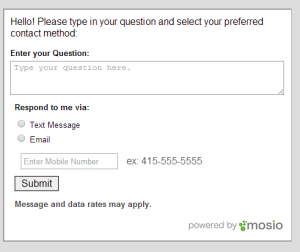 One of the greatest features in Mosio for Events is the ability to customize the color of your Text to Screen. Sometimes at an event you will have attendees who either don’t want to use texts for whatever reason, or attendees who are from other countries. You can actually create an online widget they can access from their device and participate in the event as well. You can also edit the color by adding the “/color” to the end of the hyperlink as well!